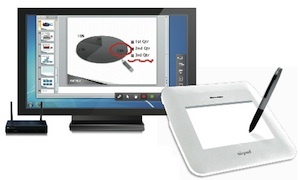 AV technology developer wePresent has started shipping its wireless classroom presentation systems in the United States. The wePresent WiPG systems support up to 64 simultaneous users, allowing them to share their screens on projectors or displays wirelessly, with 1080p output. wePresent WiPG ("wireless presentation gateway") allows users on Windows, Android, OS X and iOS devices to share their screens in a 4 x 4 grid on a projector, display or interactive whiteboard. The systems are available in two configurations, the WiPG 1000 and the WiPG 1500. Both include HDMI and RGB (mini D-sub 15-pin) connectors, three USB 2.0 ports (for enabling interactivity with interactive display devices, such as IWBs), stereo minijack and an RJ-45 jack for Ethernet (10/100). Both operate as access points and offer support for 802.11b/g/n WiFi. Various security features, including session login and WEP and WPA authentication. Galaxy Sender, an app for Samsung devices that lets users mirror their displays on screen wirelessly. The wePresent WiPG 1000 retails for $699; the 1500 runs $999. The company is working with individual schools, colleges and universities on education pricing. Additional details can be found at wepresentus.com.